Are you happy right now? Do you ever get into a funk? One you just can’t seem to get out of? I’m so there right now. I feel a little like I’m drowning and I just can’t get on top of things. My to-do list is always longer than my day. I always add more to it than I get crossed off. And there’s no end in sight. I have been wrestling with this lately. The responses I’ve gotten back from asking about your biggest struggle have been pretty clear. This is something we all struggle with at some time, I think. I don’t have any miracle solutions that will help you magically get your to-do list crossed off and I’m still a little bummed that the time I’ve been putting in hasn’t paid off like I had hoped it would. Okay, a lot bummed. But, I want you to know that I know what it’s like. This funk. This plateau. This treading water. This rut. Whatever you want to call it, I know it. But, this is what I’ve decided to do about it. I’m not going to just survive anymore. I’m going to enjoy this season. I’m going to do what I can and it’s going to be enough. I’m going to play with my kids. I’m going to savor the cooler days and the changing leaves and I’m going to do all the Fall things I enjoy. And I’m not going to feel guilty about it. I am going to be oh so happy. Maybe you’re thinking you’re already happy. Or maybe things are bad right now and you think you can’t be happy. If you’re already happy, could you be happier? If you’re having a hard time right now, that’s okay. There is still enough good in the world that you can be happy. Even if it’s just for a moment. For one tiny little piece of your day. You CAN be happy. I can be happy. Life is too short for to-do lists that never end and plateaus that never come to a rise or fall. So I’m taking control and I’m doing it. I am going to make time to be happy. I’m going to live in such a way that I will be happy. Will you join me? If you’re in and you want to make being happy a priority this season, click the button below and sign up for my Be Oh So Happy Challenge. I’ve got more details coming your way. I’m still piecing it together in my head and planning it out, but I needed to tell someone about it. Someone who will hold me accountable. Someone who wants to be happy too. Someone who wants to live more intentionally this season. Is that you? Will you hold me to this? Will you join me? 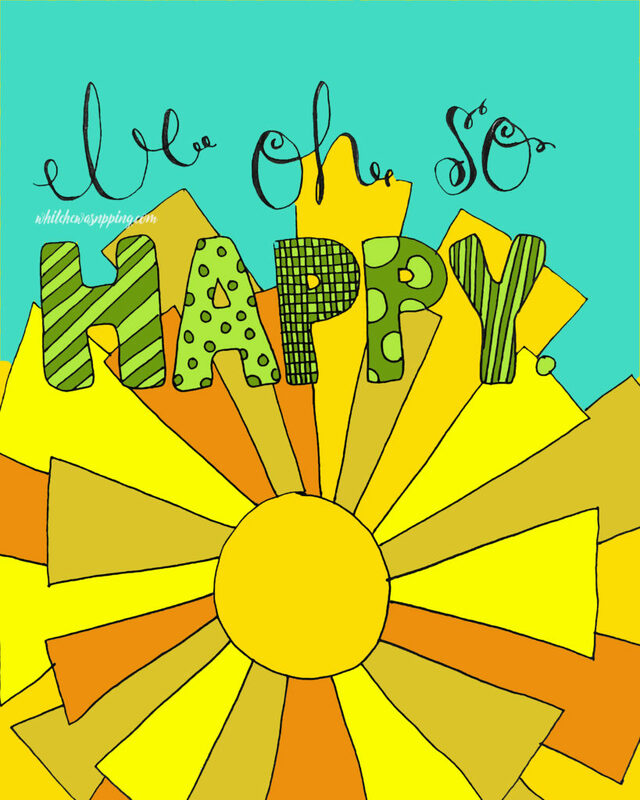 Grab a blank printable coloring page of the Be Oh So Happy image above. Give yourself permission to take the time to color your Be Oh So Happy color page. The dishes will still be there later. Color while you’re on your lunch break. Or right before bed. It’s not a complicated design and won’t take long. Coloring always makes me feel happy and this way you’ll have a pretty reminder that you are going to be oh so happy this Fall. I can’t wait to have you join me and, together, we’re going to live more intentionally and BE HAPPY!